Other cereals and pulses such as wheat, ragi, bajra, jowar, bulgur wheat, moong etc. can be added once your baby starts accepting semi-solid foods. Add a teaspoon or two of butter or ghee to these foods, as these are a rich source of energy. A great start can be made with Bajra Porridge and Jowar Ragi and Date Porridge which is an unusual and yummy porridge to initiate your baby to this diet. Begin with one to two teaspoons and gradually increase the quantity to about 1/2 to 3/4 cup. Gradually, try a combination of cereal and pulse, such as rice and moong dal in the form of khichdi. Your baby would best accept a well-mashed khichdi, which will be easier for her to swallow and digest. Serve Moong Dal Khichdi and watch your baby happily gurgle it down. It is advisable to continue avoiding salt in your baby's meals at this stage too. However, your baby may also be able to handle a moderate amount of spices in her diet by now. Temper her meals with subtle spices and condiments like asafoetida (as it aids in digestion), pepper powder and fresh herbs so that she develops a taste for them, like we have added in the recipe of Carrot and Moong Dal Soup. Some babies may just love this addition to their meals and happily consume spicy foods like onion, garlic and ginger too after 8 months, while others may find even a simple carrot indigestible. Introduce spices to your baby's meals only gradually. Newer textures and flavours can also be introduced in the form of vegetable purées like Apple Stew, Cauliflower and Broccoli Puree, Banana and Jowar Sheera, Walnut and Paneer Puree etc. Start with purées and dal mash in the beginning of the eighth month, and in the ninth month gradually transition to combinations like Coriander Curd Rice and Moong Dal Khichdi which are blended to give a texture somewhere between mashed food and normal cooked food. 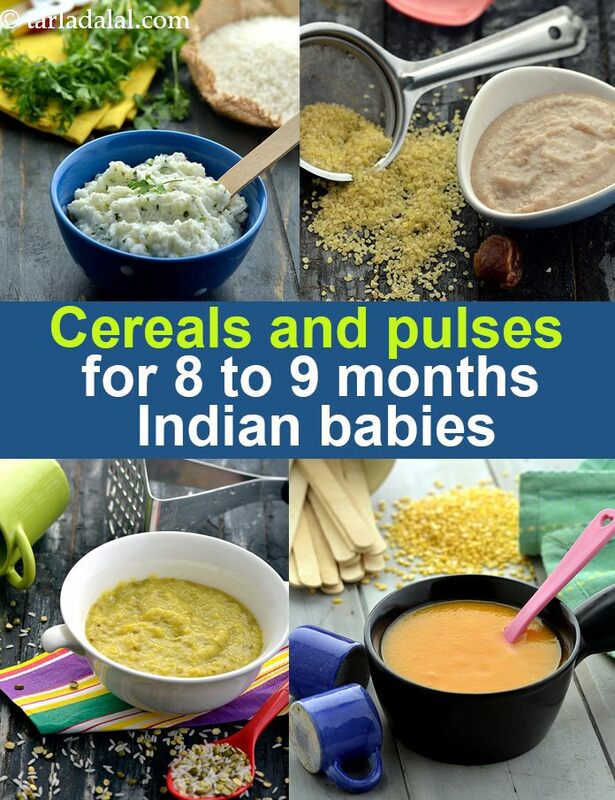 To meet the increased demands of calories and protein of your growing baby, you can also start with malted porridges that are made with different grains like wheat, ragi, bajra, jowar etc. The process of malting involves soaking the grain overnight, draining the water and tying them in a muslin cloth to allow them to sprout for two days. Finally, dry roast the grains on a tava and then grind into a flour. This process converts the starch present in these grains to amylose due to the increased production of an enzyme called amylase and hence it gets the name Amylase Rich Food (ARF). This conversion makes thinner porridge and enables your baby to eat more. Flip the pages and try out recipes like Nutritious Sprouts and Banana Porridge. Try your hand at this porridge as the first meal of the day every morning to ensure your baby gets enough nutrients to be active throughout the day. It is even great to carry with you if you are going to be travelling with your baby as it makes a nutritious and hygienic meal for your little one. You can also add these flours to the baby's soups and dals to make her meals more nutritious. By around this time, your little one may drool and be irritable at times and chances are that she's teething. This is also a great opportunity for her to start learning eating techniques like biting and chewing. As your baby starts growing teeth, she will want to nibble at anything that comes in her way. She may be irritable and refuse food, wanting to bite on hard objects. This is the time when you have to be careful and alert to take care not to keep any sharp objects within your baby's reach as they can hurt her. Give your baby finger foods like a small piece of carrot or cucumber to nibble. These will help soothe your baby’s gum irritation. Your baby may also start showing signs of independence and will want to hold on to foods. Supervise carefully while your baby is chewing on such foods as she can gulp a big piece down and may choke on it. During the teething months, sometimes babies may show signs of indigestion or vomiting. This is usually a result of chewing on all kinds of things to ease gum irritation. Sterilize all the toys that your baby is likely to chew on. Be careful that your baby does not eat any uncovered food to relieve her irritation, as it may be unhygienic and cause digestive problems like diarrhoea and dysentery. Please do not panic and do consult your paediatrician at such times.